The possibility of superconductors – materials that transmit electricity with no energy lost to resistance – for everyday use has tantalized physicists and materials scientists since researchers discovered superconductors more than a century ago. The materials have been used in high-powered magnets like those found in magnetic resonance imaging machines and particle accelerators. But they haven’t moved into general use because they must be cooled to extreme temperatures of just a few degrees Kelvin – near absolute zero – to reach their superconducting state. The notion of everyday superconductors became even more intriguing in 1986, when physicists discovered materials that become superconducting at slightly balmier temperatures – up to 150 K or about -123 C. That means inexpensive, ubiquitous liquid nitrogen can chill them to superconducting conditions rather than the costly liquid helium used for standard superconductors. These so-called high-temperature superconductors may mean scientists could someday develop materials that act as superconductors at or close to room temperature, leading to tremendous energy savings. Superconducting materials also display interesting magnetic behavior, says Thomas Maier, a researcher in Oak Ridge National Laboratory’s Computer Science and Mathematics Division and Center for Nanophase Materials Science. Yet even after three decades of research, physicists still don’t fully understand and agree on the complicated mechanisms that account for superconductors’ electrical and magnetic behavior, Maier says. To dig into these mysterious materials, Maier and his team are drawing on an allocation of 60 million processor hours on Titan, Oak Ridge’s Cray XK7 supercomputer, through the Department of Energy’s INCITE (Innovative and Novel Computational Impact on Theory and Experiment) program. High-temperature superconductors are made of layered combinations of certain atoms. Copper oxide superconductors have two-dimensional lattices of copper surrounded by four oxygen atoms. Atoms of an insulating element such as strontium are sandwiched between the copper oxide layers. Materials with the highest transition temperatures – the temperatures at which they become superconducting – have more layers, Maier says. Physicists agree on how these materials are structured, but understanding the unique behavior of their negatively charged electrons is more complicated. Two interacting electrons typically repel each other. In metals, such as a copper wire, the electrons don’t interact much with each other because they’re screened by other particles. But in copper oxide and iron-based superconductors the electrons show stronger interactions, Maier says. These are known as strongly correlated materials. Researchers can computationally study metals relatively easily using a technique called density functional theory (DFT). But DFT doesn’t work when scientists have to consider strong interactions between multiple electrons. Researchers instead developed a simplified method, called the Hubbard model, to depict electron movement in strongly correlated materials by focusing on electrons within the copper oxide (or iron-based) lattice and describing the repulsion between them when they sit on the same atom. 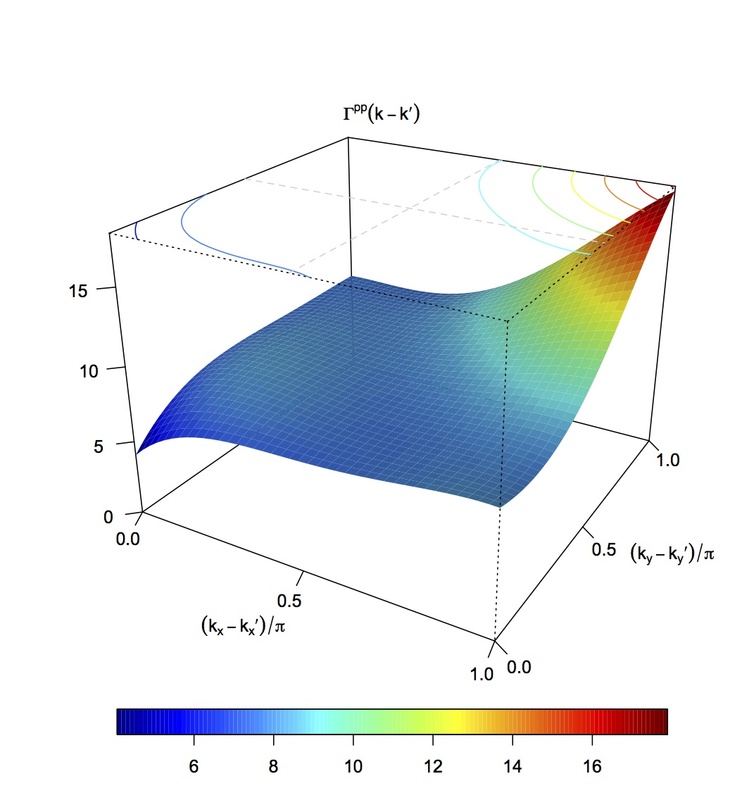 Maier and his colleagues moved the Hubbard model to the computer using Dynamical Cluster Approximation (DCA), an algorithm that uses a Monte Carlo technique relying on random sampling to capture particles’ quantum mechanical interactions. The researchers create the most accurate picture possible of the electrons within a small region and then use that detail to approximate interactions across a larger group of atoms. This computational model behaves like the materials do in experiments: The copper oxide or iron-based materials become superconducting after the insulating layers are doped. Recently the team improved the method, now called DCA+, so their descriptions now can provide numerical predictions rather than simply describing what occurs. “We can actually calculate transition temperatures very accurately,” Maier says. With the improved algorithm, Maier and his colleagues can ask fundamental questions about the behavior of high-temperature superconductors that physicists can’t address with experiments. He and his colleagues can begin to investigate exactly how the materials’ atomic structure and the interactions between various components lead them to become superconductors. They can begin to ask fundamental questions such as why a material becomes superconducting. Scientists hope that understanding the conditions that determine the transition temperature and the underlying quantum effects will help them learn what makes a good superconductor. And with that knowledge they could start thinking about designs for new superconducting materials with higher transition temperatures.